*Disclaimer* I wrote this a week or so ago, and it seems Dozier may be heating up. But my attempt at analysis still applies . I know at this point most of you are thinking: who cares why Brian Dozier is struggling? We are moving on from him anyway. While this could be true, I am fascinated by diving into why player results change (positively or negatively) drastically from year to year. 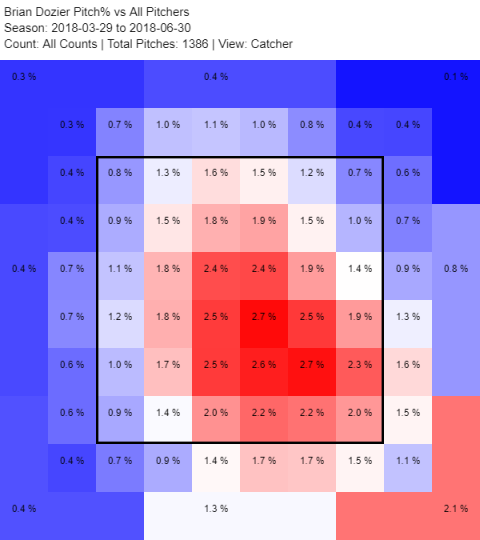 So, why did Brian Dozier go from a solid consistent power hitter to struggling this year? It may not be as obvious as you think. When a player’s numbers are down, you expect one of two things: 1) the player is striking out more, or 2) he is making worse contact. In Dozier’s case, it’s the latter. In fact, his strikeout rate is actually down. But we’ll get to that later. Statcast shows Brian’s average exit velocity this year is 86.9 MPH. That is down from an average of 87.5 MPH in both 2017 and 2016. 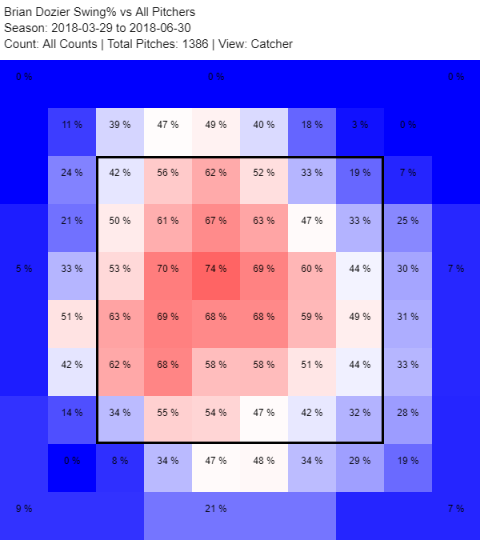 This may not seem like much, but when you look at his “Barrels/Plate Appearance” there is a significant drop this year (2018 – 3.7, 2017 – 5.5, 2016 – 5.8). If you want to learn more about what a “barrel” is and how it’s measured, check out this article. Another key measure here, especially for power hitters, is the average “hard hit” rate. A hard hit is considered to have an exit velocity of over 95 MPH. In 2018, Dozier’s hard hit percentage is 27.8%, compared to 34.5% in 2017, and 36.2% in 2016. As you can see, the only considerable deviation from his career average is he has getting more sliders (SL) in 2018. Sometimes cut fastballs (FC) and sliders merge together in pitch type, so this could account for the adjustment. Again, pitchers are attacking Dozier almost identically as they did in 2017 (down and away, like most hitters). At this point, I turned to Dozier’s actions for the answer. My impression of the change is this: Dozier is becoming pickier with his pitch selection. Notice in the 2018 chart the red zones are much more concentrated in the middle part of the zone. In 2017, there is a wider distribution of swing % prevalence. 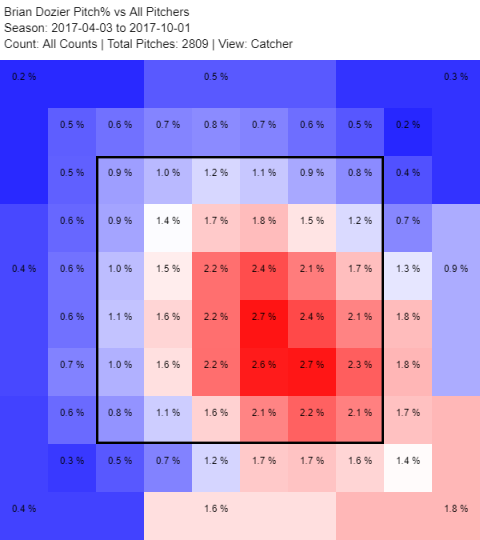 In other words, Dozier was much more aggressive in 2017 with his pitch selection, swinging at more pitches outside the middle. 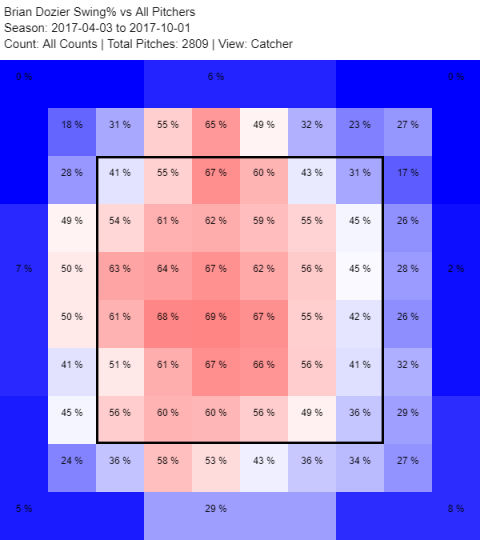 Furthermore, Dozier is seeing more pitches at the plate than in years past. In 2018, he is seeing an average of 4.10 pitchers/plate appearance. Compare that to 4.03 pitches/PA in both 2016 and 2017. I know I miss the days watching Dozier hammer the first heater he sees. Maybe there are other contributing factors that I am missing, but I think an approach adjustment could benefit Brian as much as anything else. It also could be he enjoys hitting first in the lineup to attack the pitcher just trying to establish his fastball. Even though Dozier will most likely be gone after this season, I would still like to see him do well in the second half. He deserves it. Nice analysis. A lot of interesting data. In this particular case, I think conclusions are not obvious. Dozier’s walk rate is also down...at the same time his pitches per at-bat are up, his chase rate is down and his contact is weaker. Much of that is counter-intuitive. I think the simplest conclusion may be the only one that holds water...he’s simply not getting the barrel to the ball as frequently as in the past. His age profiles to where this starts happening. I think it’s been slightly compounded by bad luck...as his extraordinarily low BABiP (even for him) can probably not be explained solely by the marginally weaker contact. I agree with your hypothesis that he's taking too many pitches, but I think that's a secondary factor. Sadly, I think he's just hit his age of decline. Sometimes we forget that the era where a lot of age 30 plus players maintained their production to their mid-30s was also the age of PEDs and where every clubhouse had a jar of greenies available for before the game.Dozier plays every day and I think he wears down at his age. With no amphetamines to "perk him up", he is going to have more days where he's just a split second slower and that equals weaker contact. In other words, I think he's just getting older and not as productive. I do feel bad for Dozier.He signed a team friendly contract in the days when being a free agent at age 30 or 31 was a bonanza. Now in the age of analytics and brothers getting no chemical help an age 31 ballplayer has to be really special to even get 3-4 years above the 9 mil he got this year.Add a bad year and he's in a tough spot. I think he's gone after this year - the FO doesn't really want him and he doesn't really want to stay - so I hope we trade him to a team with playoff aspirations.After this year, he may be one of those guys going year to year hoping for the right fit and 5-7mil a year.Not a bad gig, I know, but still not what he thought he'd be. I am not sure if it's simply age or bad luck this year. But one thing is he consistently struggles with high sliders, especially away. And the other issue may be that a player who made his mark sitting on get em over FB and all pull will likely find that hard to sustain as long as a more "diverse" hitter. If nothing else he made a nice living for himself finding his little niche for a few years.